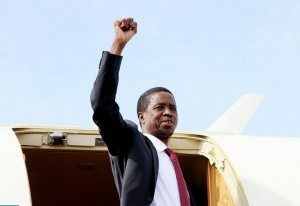 Unless one is either injuriously naïve or deliberately playing the partisan madness, the current president, Mr. Edgar Lungu and the PF have no clue how to govern the country. We all thought Kenneth Kaunda was an authoritarian (he was a school teacher). We thought that Frederick Chiluba was too tender on corruption (he was a trade unionist). We thought that Levy Mwanawasa was too vengeful on political opponents (he was a lawyer). We thought that Rupiah Banda was naïve (he was a seasoned politician). And we thought that Michael Sata was an epitome of dictatorship (he was allergic to corruption). But who would have thought a 21stcentury lawyer would declare a State of Emergency for a nation that has been relatively “peaceful”? By Charles Mwewa – Concerned Zambian Citizen. WHERE IS ZAMBIA IN ALL THIS? Where is the president of Zambia? The leaders have also called on Africa’s private sector to seize available opportunities to promote sustainable development which will lead to the creation of jobs. The move they say will help in the fight against poverty which will then discourage Africans from engaging in dangerous trips to Europe. “The Marshall Plan for Africa which you are calling for should also be supported by the Africans themselves and their regional authorities. That happens through more rigorous government, the fight against corruption, the fight for good government, a successful demographic transition,” said French President Emmanuel Macron. NGO’s consider the approach disappointing because although it will boost the private sector, it does not in any way compel rich countries in their commitment to development assistance. For now the decisions taken concerns only six African countries which are already pulling investors and are not the main source of migrants to Europe. They are Côte d’Ivoire, Ethiopia, Ghana, Morocco, Rwanda, Senegal and Tunisia. UPND campaigned against the Referendum that was aimed to enhance peoples rights. Now they are opposing a measure that will protect the nation. Someone tell me what this party stands for, GOOD or BAD? I am totally confused. Zambians campaigned against abuse of power. Today moyrner are not allowed to bury their dead with PF cadres attacking them. The lazy president said nothing to this day. I dont care about the State of Emergency BUT I think lungu is making alot of mistakes lately. Who are his friends apart from these juveniles he calls advisors? He needs male Alangizi to advise him.